To westside cm: if you're Anglo, be brave and go to the meeting with an open mind and a civil attitude, and you'll see a lot of good and kind people. If you go with a smile and a friendly attitude, you will even meet some. If you're Latino, shame on you for your posting. You should know better. Oops. As I was writing this, I realized that my invitation was too late. Westside cm, I urge you to look for the next opportunity to meet your good neighbors. Get a grip, buddy. Read the invitation. The ones being exclusionary are the sponsors. Hilarious that you jumped on the bigot bandwagon without even realizing what my post was about. 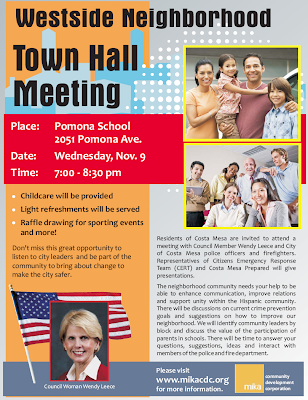 Leece and Mika aren't interested in costa mesa community unity, just the hispanic community unity i guess. Also, what was with all the pastries and sugar sodas, is this what Mika promotes - terrible nutrition for the hispanic community?